Fall is harvest season and kicks off AHB’s first harvest of hybrid poplar for bioenergy. The Jefferson, Oregon and Hayden, Idaho demonstration sites were both harvested at the end of September and early October respectively. The trees grew rapidly at both sites and were ready for the first harvest after only two growing seasons. The first harvest of hybrid poplar at the Hayden, ID Demonstration Site in October 2013. Photo by Darrel Kilgore, WSU. Once planted, the first harvest sets the stage to produce a poplar “coppice” in which multiple shoots will sprout from the cut root stalk in the spring. 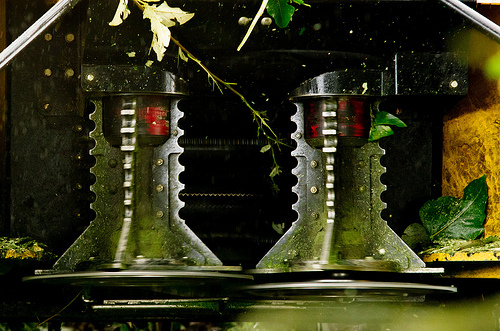 This technique encourages new growth that will produce more biomass for the subsequent harvests. The trees will be harvested again in two or three years, yielding up to five times more biomass than the initial harvest because of the multiple stems on an established root stalk. A forage harvester, from Case New Holland, cut the small trees as it moved down the rows. The forage harvester was built to harvest corn and was modified with a separate attachment with two rotating saws that cuts the small trees and then feeds them into the forage harvester chopping system to make poplar chips. Head on forage harvester, photo by Marcus Kauffman, Oregon Department of Forestry. A large truck or tractor with trailer moves beside the harvester to collect the chips as they are being harvested. This single pass harvesting system allows the chips to be sent to the biorefinery or another buyer directly from the field. Bruce Summers of GreenWood Resources, Inc. explained that the idea is to mimic the Midwest corn harvest because of the efficiency achieved with the forage harvester. Summers said the hope is that the forage harvester can harvest 1,200 tons of woody biomass per day that can go directly to a biorefinery. To track productivity and fuel usage, researchers from the State University of New York used GPS equipment on the harvester and trucks to track operations and perform a time motion analysis. This information will be useful for improving harvesting efficiency by understanding actual production time versus total operating time. The data will help quantify the benefits of producing the poplar-based biofuels compared to fossil-based fuels. 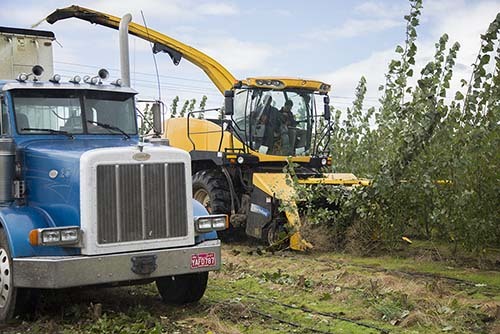 From this harvest, two truckloads of chips from both the Jefferson and Hayden demonstration sites were sent to the ZeaChem biorefinery in Boardman, OR for biofuel testing. Another batch of chips was sent to a lab at the University of Washington where researchers will compare fuel production from chips containing leaf matter to clean chips containing no leaf matter. This will give researchers the ability to address any problems in making biofuels from the chips that include poplar leaves. To test and compare the conversion efficiency of each hybrid poplar clone, the poplar clones were planted in different rows so that the clones can be separated as they are harvested. This allows for research on individual poplar yields and helps determine which varieties will be best suited for building a sustainable biofuels industry.